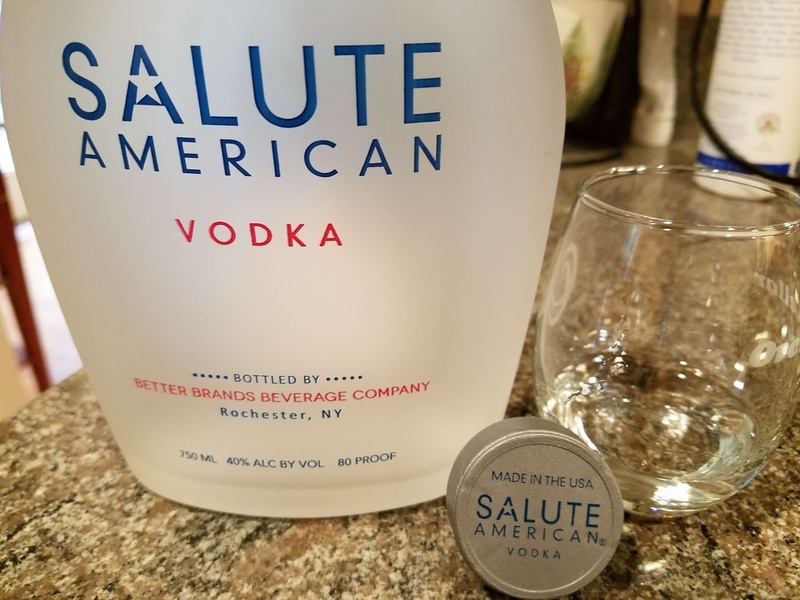 If you are looking for a patriotic and smooth vodka this Memorial Day weekend or for the upcoming 4th of July then start searching for Salute American Vodka. 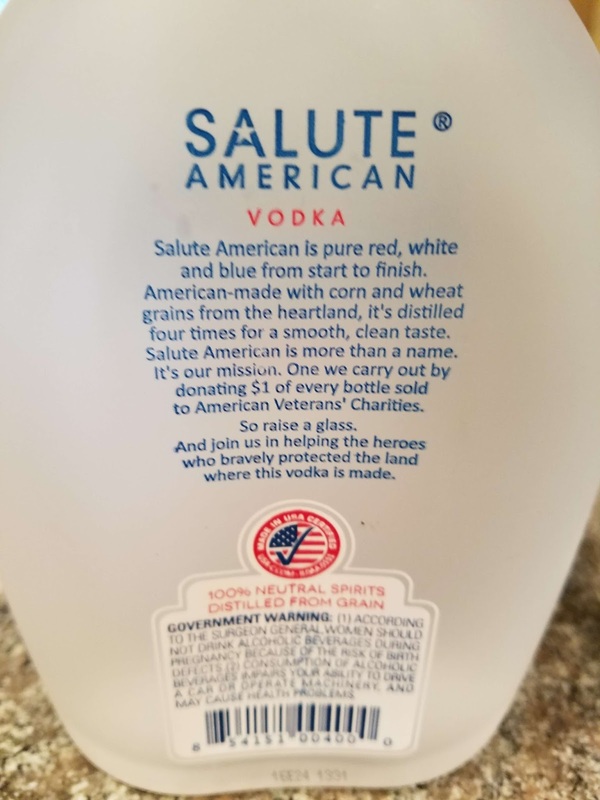 The native spirit is not only distilled and bottled in Rochester New York using Midwestern corn and wheat, but the "signature red, white, and blue 750ml bottles (modeled after World War II standard issue GI canteens) are manufactured in New Jersey". In fact the label contains the USA Certified™ seal where the parent company passed an audit and certification process that proved that all product assembly and American labor comply with all U.S. safety standards and labor laws. 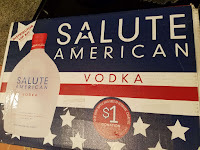 In addition, one dollar from every bottle is donated to charities supporting active and retired military personnel. "Patrons have the opportunity to localize the dollar by nominating resident heroes to receive support in their communities through the company’s program Salute American Heroes. In 2017, the company aims to impact five different veterans through donations to charities that support those veterans’ pursuit of the American dream. 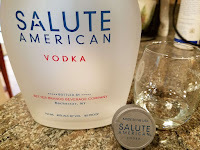 Salute American Vodka has an award-winning taste with an honorable social mission". But what about the vodka? The spirit is distilled four times then cut to 80 proof. It is clean with a sweeter profile that thickly coats the palate and finishes very smoothly. Easy drinking neat, but who drinks vodka straight? Instead, cocktails are your best bet and Salute offers a range of drink recipes such as an Apple Cider Cocktail or Salute Raspberry Lemonade. 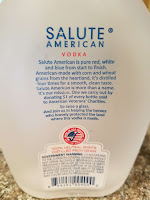 Now, I received this bottle as a sample and currently Salute American Vodka is only available in the Northeast. 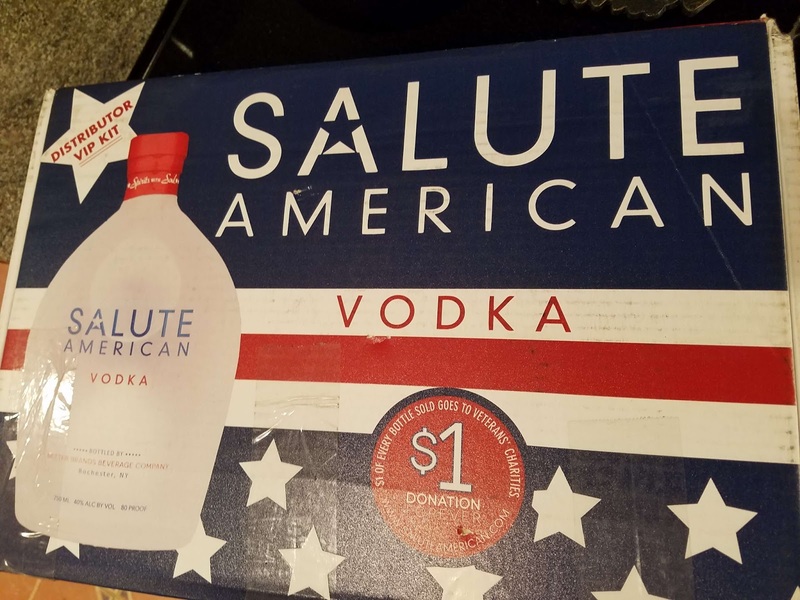 But the company is quickly lining up distributors in other states and hopes to have the vodka available in the Mid-Atlantic very soon. Cheers and happy Memorial Day. The international wine market contains an overabundance of affordable value wines with Wines of South Africa (WOSA) strongly situated in that category. 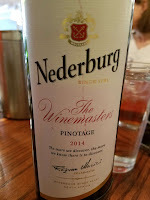 And one of the most awarded and innovative wineries within the WOSA is Nederburg, continuously operating since 1791. 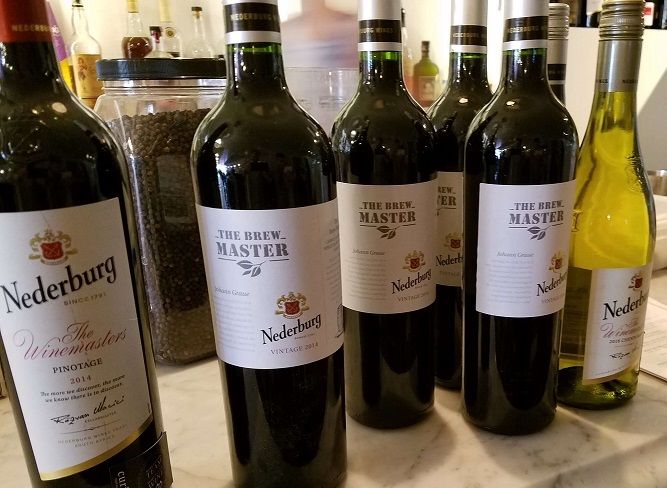 Last week the current Cellar Master of Nederburg, Andrea Freeborough, visited the DC area to share the history of the winery as well as a few wines in their portfolio that honor this rich history of 200 years of winemaking. Philippus Wolvaart, a German immigrant, purchased the beginnings of the estate in 1791, named it after his Commissioner-General, Sebastian Nederburgh, and soon planted wine grapes. 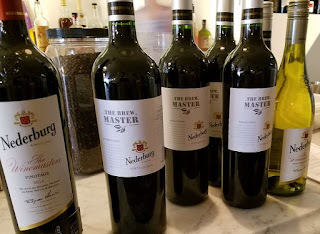 The estate is located in the Paarl region that soon would become the heart of the South African wine industry until the focus shifted southwards to Stellenbosch in the later 20th century. According to Gavin Hubble, The Wine Guy, Paarl's "climate is very similar to the Rhône Valley in France, with moderate warm summers cooled by Atlantic breezes towards harvest season". Over the years Nederburg changed owners but the real innovations started in 1937 when Johann Graue purchased the winery. 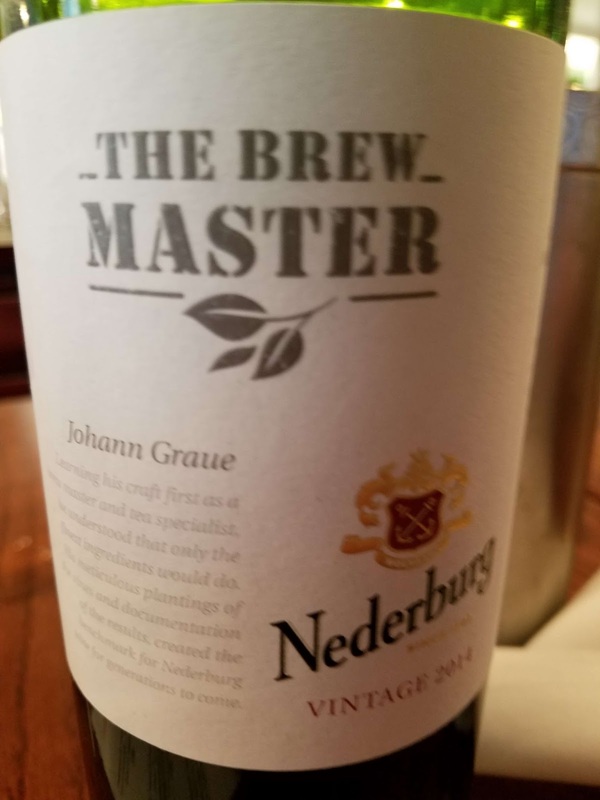 He introduced cold soaking and other vineyard, cellar, and blending innovations which continued though legendary winemaker Gunter Brozel and continues to the present with Freeborough and her team of five winemakers. 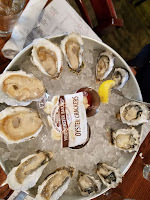 During our lunch at Hank's Oyster Bar, Freeborough shared five wines that were not only delicious but excellent monetary values. The grapes for these wines were sourced from the best vineyards in Paarl as well as throughout South Africa. Whereas Germany is the winery's largest export market, Andrea hopes this trip moves the United State's closer to that threshold. Cheers. 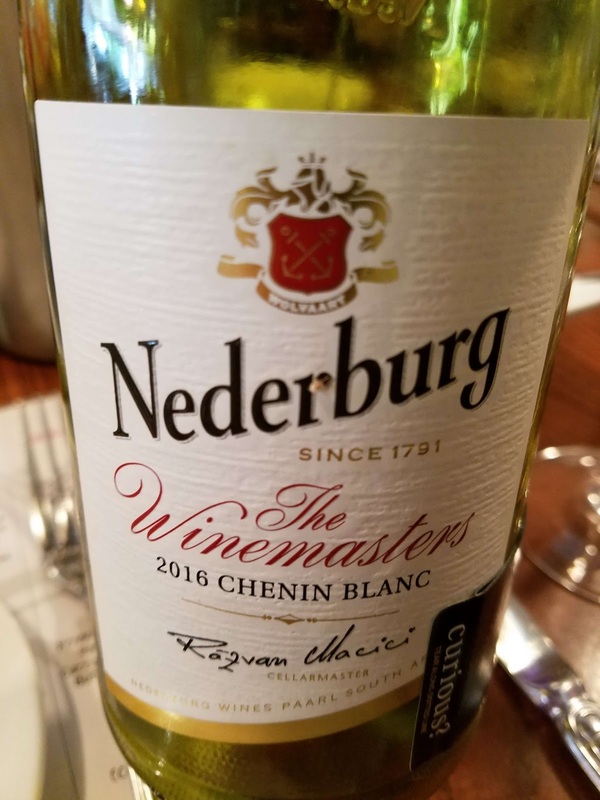 The Winemasters 2016 Chenin Blanc ($12, 13.5%). This is the latest wine in portfolio with the fruit sourced from cool climate vineyards. It provides very strong aromatics and acidity at the nose and the tail with a great mouthfeel in between. Thank 6 months on lees for that sensation. Great value. The Young Air Hawk 2016 Wooded Sauvignon Blanc ($21, 14%). 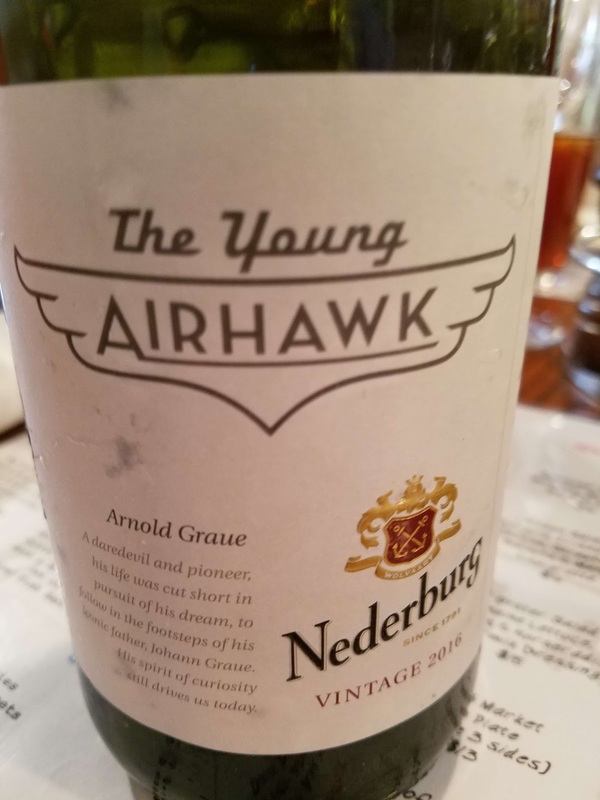 This wine pays tribute to Johann Graue’s son, Arnold who died tragically at 29 in a light aircraft crash but not before he had introduced many technical innovations at Nederburg. The grapes were sourced from selected cool climate vineyards in Elgin, Darling and Cape Agulhas, fermented in oak, and spent six months on their lees. The wine is very fresh, much fresher than you would think based on the winemaking techniques. 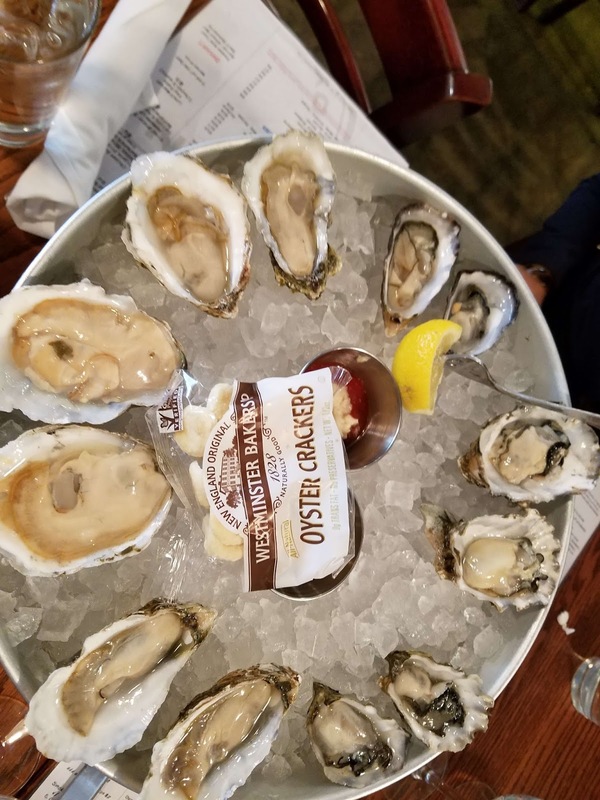 Plenty of lemon aromas and flavors, mouthfeel, and finishing with abundant acids. 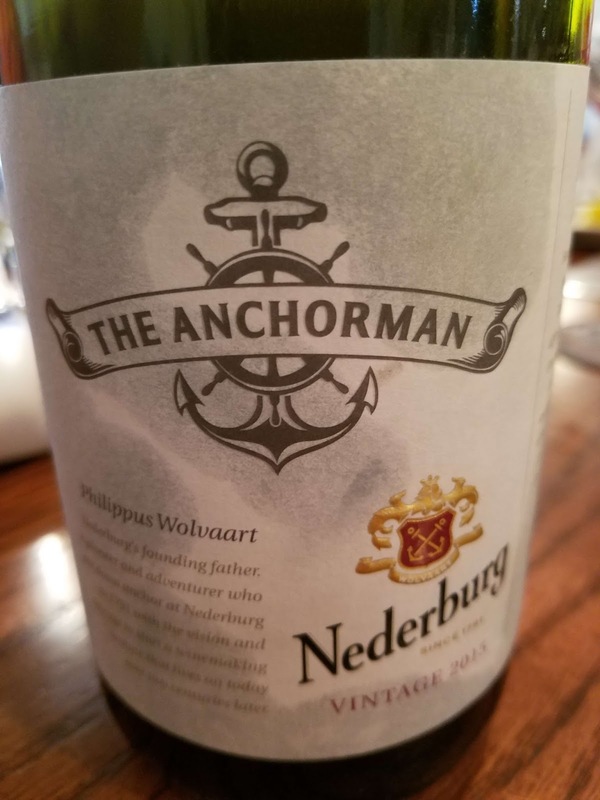 The Anchorman 2015 Wooded Chenin Blanc ($21, 13%). This wine celebrates Nederburg’s founder Philippus Wolvaart and is a blend of Chenin Blanc (85%) and Grenache Blanc (15%). The Chenin grapes were harvested from old, low yielding, dry land bush vines in Wellington and Darling, while the Grenache Blanc grapes were harvested from trellised vines in Franschhoek. Separate batches of the fruit were fermented in various vessels with a portion fermented using carbonic maceration -- where whole bunches are allowed to ferment spontaneously without being crushed or pressed. And after malolactic fermentation, the various components were kept on the lees for 9 months prior to final blending. What a complex process, but the result is well worth the effort. The wine starts with a strong floral and fruit aroma, layered depth, and a long length. Fantastic. 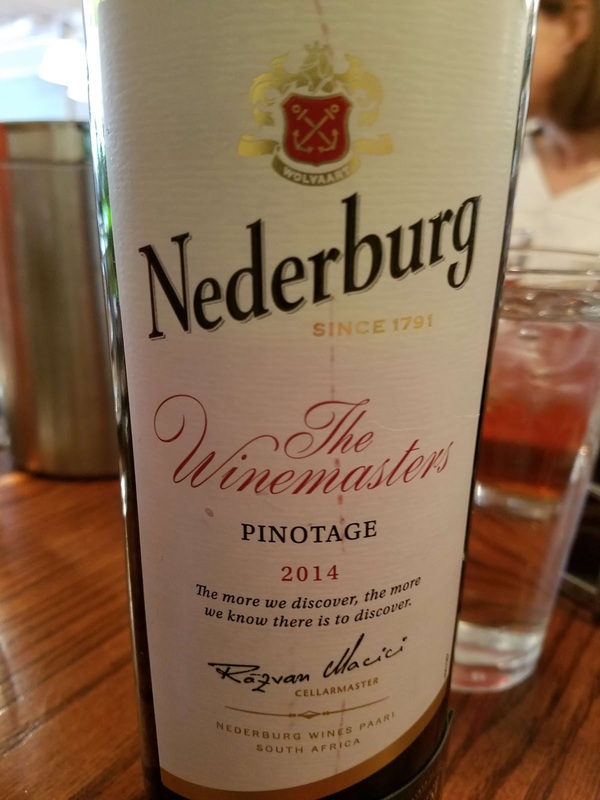 The Winemasters 2014 Pinotage ($12, 14.5%). The grapes were harvested from the Western Cape and after fermentation aged 12 months in various oak vessels including French, American and Romanian oak barrels. I loved this wine with it's subdued smokiness, balanced cherry fruit, and subdued acids and tannins. $12, really? That's it. 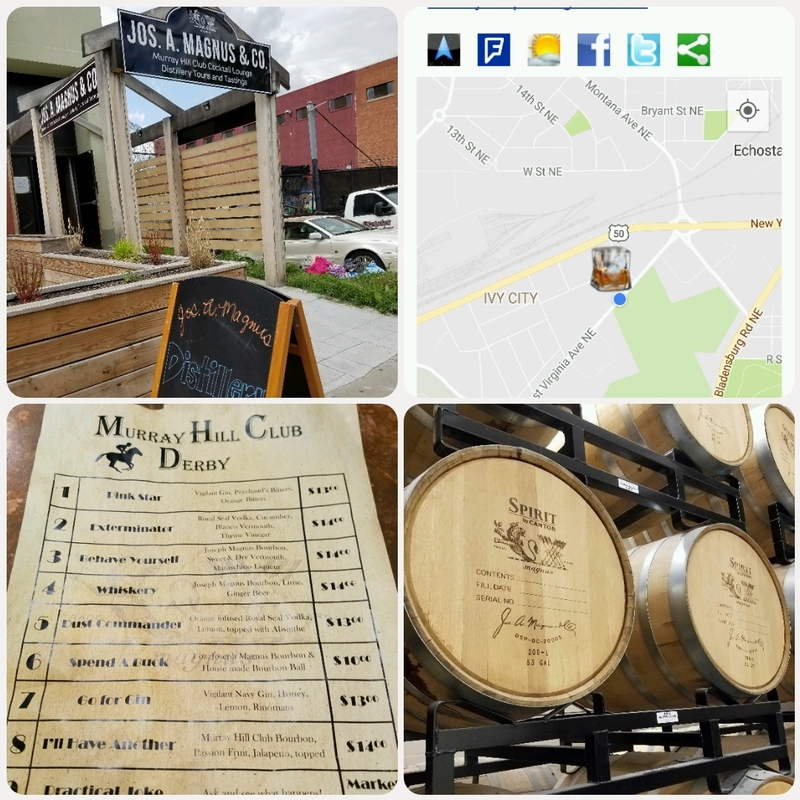 The District of Columbia now hosts half a dozen distilleries, with all but one located in Northeast's Ivy City -- a warehouse district located between New York Avenue and West Virginia Avenue near Gallaudet University. DCs oldest and most well known distillery, New Columbia Distillers, set up residency in Ivy City in 2011 where craft the popular Green Hat Gin. Unfortunately during my Sunday visit, they were closed as well as One Eight Distilling. That was not the case for Joseph A. Magnus & Co and Republic Restoratives Distillery where I spent an afternoon sampling their spirits neat as well as in cocktails. 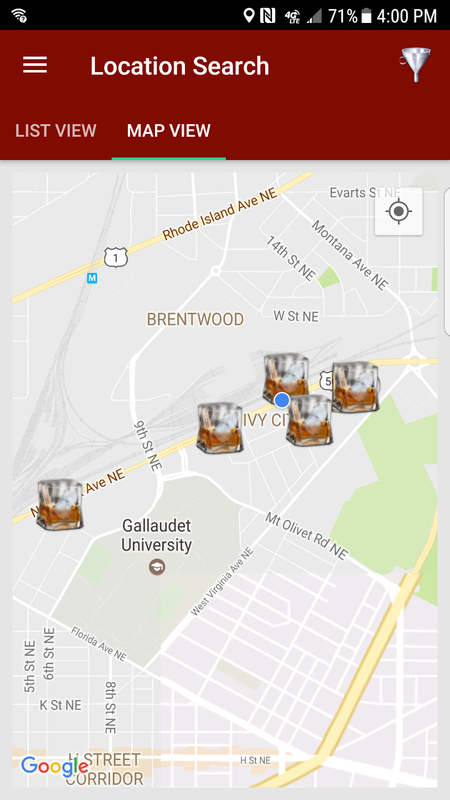 The 5th distillery, Cotton & Reed, is actually right outside Ivy City as shown on the map. Download theCompass Craft Beverage Finder for exact locations. Joseph A. Magnus & Co is located next door and above Atlas Brew Works so give yourself ample time to visit both. The distillery is based upon Jimmy Turner finding a hundred year old bourbon produced by his great grandfather Joseph A. Magnus. A new found interest in his family's distilling past led to a with to a partnership with "former Woodford Reserve distiller and Whisky Advocate Lifetime Achievement Award winner Dave Scheurich, American Distilling Institute Director of Research and whiskey blending pro Nancy “The Nose” Fraley, former Buffalo Trace Distillery VP and General Manager Richard Wolf, and Brett Thompson a co-owner of Alexandria’s Pork Barrel BBQ. 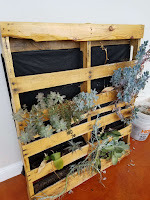 (See this City Paper article.) Along with The Gin Goddess, Nicole Hassoun, this team currently produces five spirits: one vodka, two gins, and two bourbons. During my visit I sampled these five spirits neat and enjoyed one of the cocktails from their Kentucky Derby themed May menu. Go For Gin brought back racing memories and is a tasty concoction of their Vigilant Gin, honey, lemon, and Rinomata - a new Italian aperitif from vermouth producer Giancarlo Mancino. Going neat, a tasting starts with the Royal Seal Vodka ($29, 80 proof) made from 100% corn grown in Virginia and distilled seven times. This spirit is very clean, smooth with a sweet texture that provides a mellow finish. The distillery offers two gins, the Vigilant Gin ($32, 84 proof) and Navy Strength Gin ($39, 114 proof), both infused with botanicals - a few grown in palettes strategically positioned in the sun facing tasting room. This first is a London-style Dry Gin that has a more citrus character and very mild; the second is a much stronger, 100% corn gin that grabs your attention but still remains smooth at the tail. Moving on, the two bourbons shined - although distilled and aged elsewhere the team created blends that are fantastic. The blend for the Murray Hill Club Blended Bourbon ($92, 103 proof) attempts to replicate the pre-prohibition Magnus bourbon and combines 18 year bourbon, 11 year bourbon, and 9 year light whiskey. The result is a fresh and spicy whiskey with both baking spices and pepper. Finally, the Joseph Magnus Straight Bourbon ($92, 100 proof) is a straight bourbon whiskey aged in white oak and finished in Oloroso Sherry, Pedro Ximénez and Cognac casks. This process provides multiple flavors, a complex whiskey alternating between vanilla, nuts, and fruit. All told, a great tasting lineup. 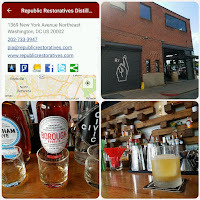 Moving on down road the one year old, woman owned Republic Restoratives Distillery is located right on New York Avenue NE with an inviting open air tasting bar where they stress a facility is just as much a craft cocktail bar as a distillery. Co-founders Pia Carusone and Rachel Gardner hired Master Distiller, Rusty Figgins to focus on bourbon but also leverage the Ivy City Gin phenomena. But first there's the Civic Vodka ($29, 80 proof), a corn-based vodka that is charcoal polished, a filtration process that provides a smooth and clean spirit. The Borough Bourbon ($55, 88 proof) is a Kentucky born whiskey (sourced until their own whiskey is ready) but then finished at the distillery in Sauvignon Blanc barrique casks. The result is a very smooth whiskey, drinking neat nicely with a little vanilla. My favorite. Finally, the Rodham Rye ($79, 90 proof) - guess who its named after - is sourced one-year-old rye and three-and-a-half-year-old rye from Tennessee. The distillery then cuts the whiskey to proof using Adirondack Mountain spring water from a maple syrup farm in upstate new York. The spicy rye expresses itself clearly, there's also a chewiness and long, complex finish. And enjoy a cocktail, mine was a concoction of honey, lime juice, and Borough Bourbon. Cheers. Dave Phinney's Locations portfolio continues to grow as the brand expands it's white wine offerings. The concept behind the Locations Wine brand was to "to produce a wine that pays homage to their home land without compromise and without boundaries" and may I add, at an affordable price point ($20 range). 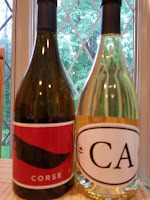 Currently there are nine red wines (France, Spain, Italy, Portugal, California, Oregon, Washington, and Texas) joined by two white wines: the inaugural California - CA4 and a sophomore release of Corsica - CORSE. 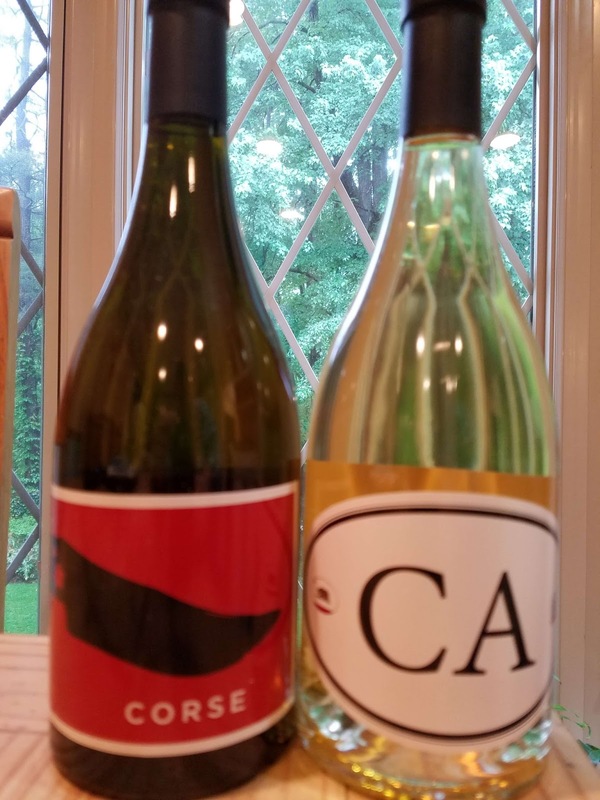 CA4 - California White Wine ($19.99, 14.5% abv) - a blend of Chardonnay, Sauvignon Blanc, Viognier, and Roussanne from Napa, Sonoma, and Mendocino to reflect the "diversity and potential of California". A portion of the fermented wine was aged in new French oak so expect a slightly buttery flavor. However, that sensation does not overwhelm the other attributes such as the bright lemon aroma and stone fruit and mineral character. And the acids provide a fresh finish. I'd prefer a little less oak, but this is a tasty wine nonetheless. CORSE - Corsican White Wine ($18.99, 13.7% abv) - 100% Vermentino and the label represents the shepherd's knife commonly used on the island. On this Mediterranean island wine production can be traced to 570 BC when Phoceans traders settled on the island. Even though Corsica is a French territory, its wine making traditiosn and wine grapes are Italian in origin. There are nine AOC regions with white wines composed primarily of Vermentino. This light skinned Italian grape variety most likely originated on the Italian island of Sardinia - located just south of Corsica. The Vermentino grapes used to produce the CORSE were sourced from "vineyards from steep, hillside slopes comprised of granite and red clay soils". The island's large diurnal change (temperature difference between the hot days and cool nights) allow the grapes to retain acids. This is an elegant wine with a complex floral citrus aroma and a fresh oily texture reminiscent of lemon peels. Expect a wet stone minerality and a clean refreshing finish. Nicely done. With at least four weeks scheduled at various beaches this will most likely be the Summer of Rías Baixas. 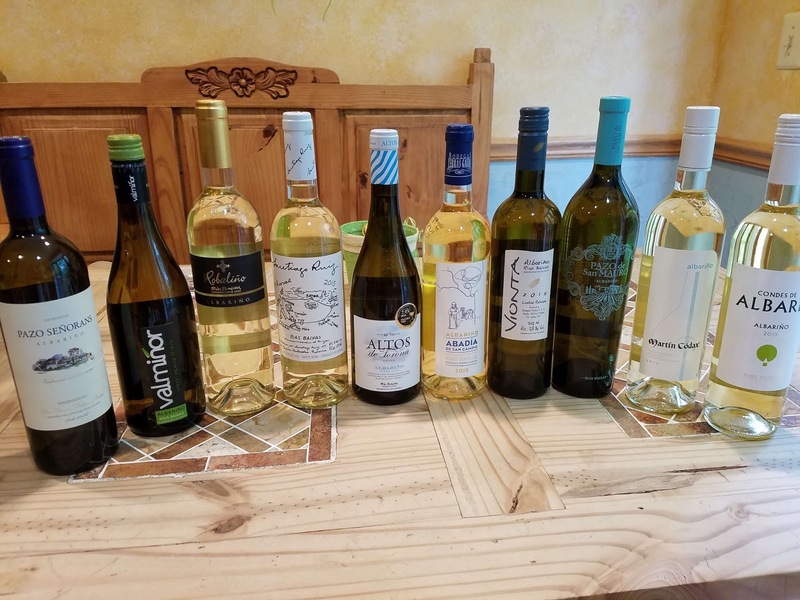 These fresh, acidic, and minerally driven wines from the northeast corner of Spain (Galicia) are designed for shellfish and seaside consumption. The Rias Baixas region encompasses five distinct sub-regions. Ribeira do Ulla is the newest (formed in 2000) and is the most northern region. Val do Salnés is known as the birthplace of the Albariño grape. This is the original and oldest sub-region and it's fingers reach out into the Atlantic. Soutomaior is the smallest of the sub-regions where the soil is light and sandy over granite bedrock. Condado do Tea (The County of Tea) is named after the river Tea, a tributary of the Miño River which separates the border with Portugal, and is the warmest and driest region. O Rosal also resides against the Miño River -- adjacent to the Atlantic. 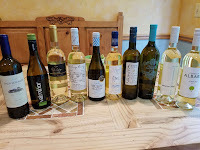 I seem to prefer wines from O Rosal but last week's Rías Baixas - Snooth tasting reinforced that diverse and delicious wines are produced in all regions (or at least the three regions that the tasting focused. Here's a short rundown of the session's ten wines all worthwhile and very affordable. Has similar acidity but a fuller body as it sits five months on its lees. Interestingly this winery is a co-op of 600 family vineyards. Ripe fruit and solid acids. Wet stone and minerals throughout, citrus aroma and tart flavor. Excellent. A blend of Albarino, Loueiro, Treixadura, Godello, and Caino Blanco - all indigenous grapes to the region. Fresh and intense hitting all the typical notes: floral, citrus, and stone fruits. And plenty of minerality and acidity. Top 2. Ms. Gürsel discussed the plausibility of this statement while discussing her Turkish winery, Vinkara, at a luncheon last month at MXDC in Washington DC. Biblical Noah is referred to as the Father of Wine and religious tradition maintains that wine-making was a divine gift in exchange for the struggles Noah encountered with the flood. With the winery located in central Anatolia and specializing in that region's indigenous grapes, it is quite feasible that Noah's goats fed upon the same grapes (or their parents) that the winery uses today. Gürsel also mentioned that there are conclusive traces of viticulture and winemaking in Anatolia going back seven thousand years, thus the region's indigenous 1,200 grape varieties have been used to create wine before and after the great flood. However, the purpose of Gürsel's visit to this country was not as an evangelist for Anatolia or Turkey specifically, or even the indigenous grape varieties, but as an ambassador showcasing the excellent wine being produced from her facility. The name Vinkara results from wine and its proximity to Turkey's capital - Vin (wine) Kara (Ankara). The winery started operating in 2003 and is located approximately 65 kilometers northeast of the capital in the hills outside of Kalecik, a small village that provides the winery with seasonal workers during harvest. The location is ideal at two thousand feet above sea level, northern winds to dry the grapes and drive away bugs and birds, and the twenty degree diurnal temperature change allows the grapes to retain acidity. One of these grapes is often the red Kalecik Karasi (pronounced kah-le-djic-ah-ser) - once on the verge of extinction due to neglect, but now Vinkara's signature local grape. During the lunch with Ms. Gürsel we sampled through a range of her wine which in general I found to be clean, intriguing, well made, and delicious. 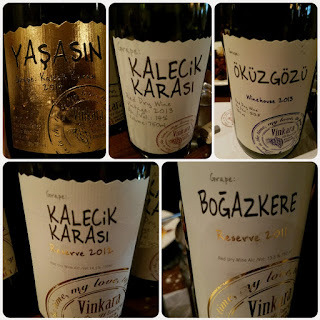 2014 Yasasin ($40) was the first method champenoise wine produced in Turkey (the others used the Charmat method). It is made using Kalecik Karasi and is fresh with toasted almond bouncing through the dry and refreshing wine. 2014 Narince ($18, nah-rin-jay), the name translates to "delicately", originates from the Tokat Province near the Black Sea, and is the offspring of Kalecik Karasi. Ms. Gürsel believes the grape may be the grandfather of Pinot Noir. The intriguing aspect of this wine is easily it's texture (3 months on lees) which allows the stone fruit to seamlessly transition to fresh acids. 2013 Narince Reserve ($27) . This wine sees 14 months in mostly neutral French Oak plus the winery holds the wine an additional six months after bottling. This process adds even more texture as will as a spicy character - but avoids the overly buttery character of many Chardonnays. And the finish is just as fresh as it's sibling. 2013 Kalecik Karasi ($18). This red wine is unoaked which leads to an extremely smooth wine, with a bright cherry flavor and a slightly spicy finish. This is the equivalent to an All Day IPA - I could enjoy this wine at any time during the day. 2012 Kalecik Karasi Reserve ($27) . This wine spends 14 months in oak and is a caramelized version of it's companion with much more depth. It's an excellent wine - actually a special wine with a very unique profile. 2013 Okuzgozu ($23, ookooz-goo-zoo). The grape is native to Eastern Anatolia and it's black berries resemble a bulls eye - hence the name's translation. This wine had the most character - as in being a character. It is approachable and smooth yet the very unique tannins and acids seem to play tricks on the palate. 2011 Bogazkere Reserve ($30, bow-aahz-keh-reh). The grape's name translates to "throat burner" but don't equate that sensation to the wine. It is fantastic: dirt and pepper aroma followed by fresh fruit but solid tannins. 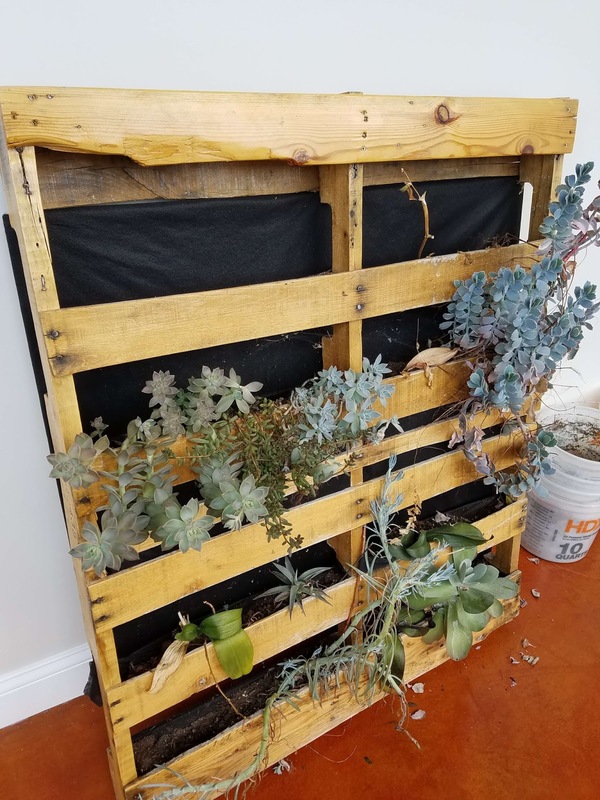 Structured from start to finish. The wine was aged 30 months oak with the winery taking an additional two year hit holding back in the bottle. My favorite of this collection and one to target immediately. Cheers.